Interestingly the nominal compromised Christian who cannot buck the tide and forego his idol of Christmas has a verse too. And at surface level this verse does seem to give clout to his compromise in observing this Babylonian abomination of Christmas. That verse is Romans 14:5,6. “One man esteemeth one day above another: another esteemeth every day alike. Let every man be fully persuaded in his own mind. Etc” But does that verse really justify his compromise? We cannot do better here than to quote the words of another . . . . 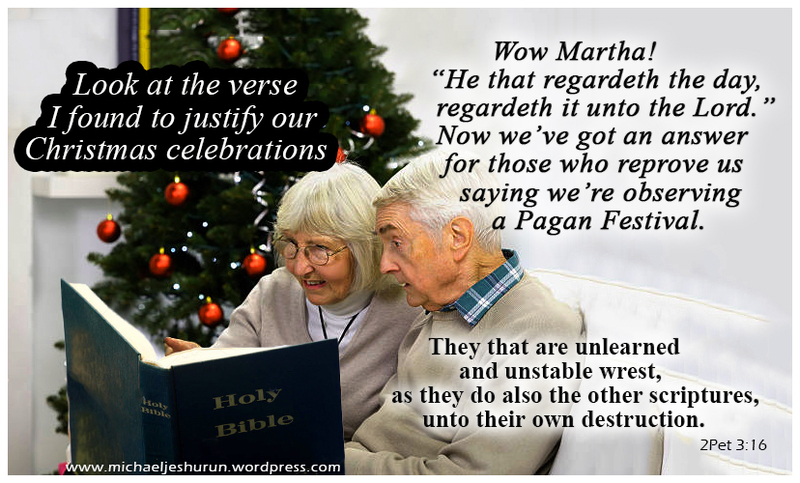 Proponents of Christmas often appeal to these verses to defend their celebration of this pagan holy day. At first glance this scripture appears to support their position. But the Bible student should look closer, determining the context and whether this passage can have application to the syncretistic festival of Christmas. Most commentators teach that Romans 14 deals with Christian liberty. It does, by way of interpretation, only narrowly. By way of interpretation merely two problems are covered, that of whether or not to eat certain meats and whether or not to observe certain days. With regard to Christmas, it is needful that we deal only with the observing of days. The disputes in this passage take place not because there are simply differences of opinions. The disputes arise because some in the church are weak (immature) and others are strong (mature). This is important to keep in mind because in time one should expect the problem to be solved by the immature becoming mature. (Of course we understand that there might be others coming into the church continually with the same problem, thus protracting the dilemma for some time). The goal of Biblical instruction is to make the saint a mature person in Jesus Christ (Col. 1:28). Thus in regard to this passage, we need to understand that if all the believers in the church had reached a certain degree of maturity, the problem would not have existed. The solution that Paul gives should be considered a temporary solution for these weak brothers and not a permanent one. (No one would disagree that Christians should always respect and love each other). We should expect these who are now weak to one day become strong as they reside under proper instruction. The specific problem in verses 5-6a concerns the keeping of days. It appears that the majority of commentators understand the problem to arise from young Jewish converts to the Christian faith. These converts feel obligated to continue to observe Jewish holy days. This should not surprise us for these were proper days for them to observe prior to the work of the Lord Jesus Christ. They have not at this time received the understanding that it is no longer necessary for them to observe these days under the new covenant. We find them in a transition period in which they are confused. If they were to not observe these days they would feel that they were not being obedient to God. They don’t have a grasp on the glorious truth that the work of the Lord Jesus Christ is complete and the days that they observe are only shadows of His fullness (Col. 2:17). The dispute involves different understandings between weak and strong brothers in Christ. The weak feel that they must observe the Jewish holy days as they were previously commanded to do. The strong understand the completed work of Jesus Christ and the new covenant make these days obsolete. These different understandings cause dissension. The only possible solution at this time is for both groups to accept one another in love. In time we should expect the weak to become mature after they have been instructed in the truth and come to an understanding of what Jesus Christ has accomplished. This is believed to be the interpretation of this passage or its proper understanding. Thus we must expect anyone making application from this passage to keep this understanding in mind at all times. This is the question which now comes before us: Is the Christian observance of Christmas protected by way of application in this passage? To determine this let us consider the circumstances involved in both cases and see if there are any likenesses. We shall consider the situation addressed in Romans 14 and compare it against the situation of present day Christmas celebrants. (1) The young Jewish believers observed a day. Those who celebrate Christmas are celebrating a season and a festival. Although they claim to celebrate a day, their actions betray them. Long before the day arrives they will be putting up trees, shopping for presents (not for Jesus), building and placing creches, decorating with lights and other objects (many of occultic background), planning and going to parties and endlessly talking about these activities. (2) The Jewish converts were keeping days that they were previously obligated to observe. The Christmas celebration has never been sanctified by scripture. It is built upon the lie, which is acknowledged by most everyone, that Jesus Christ was born on December 25. Rather than having support from the word of God, it is man made religion which is condemned by Jesus (Matt. 15:9). (3) When the weak Jewish convert kept a day, there were disciplines that he performed. For instance, if he felt he needed to keep the sabbath, he had instruction from the scripture with regard to his activity (Deut. 5:12-14). The celebrants of Christmas adhere to no spiritual disciplines. If they were to spend the day in the scripture with fasting and prayer they could at least be commended. However, the day will be spent by most in a festive atmosphere, eating, exchanging gifts and doing whatever they choose to do. These are the same “spiritual disciplines” that the pagans have done as this Babylonian festival evolved. (4) The observances of these young Jewish believers did not take place in the church. The day that the weak brother regarded, he regarded it unto the Lord. The observance that he performed he rendered without the presence of those who did not wish to take part in the observance. For certain observances he most likely went to the synagogue. The strong brother was not required to endure the observances of the weak. The Christmas celebration takes place within the church as well as in the world. In most churches the celebration generally consumes the month of December with decorations in the church building, parties, programs and some emphasis in all the services. If there is one who does not desire to celebrate, he must choose between being absent or enduring the festival. (5) The weak Jewish brother could be expected in time to mature and be released in conscience from observing obsolete holy days. The celebrant of Christmas expects to continue in a syncretistic fable originating from Babylonian mystery religion on a day when the now glorified Son of God was not born. Thus, this writer concludes that Romans 14 does not exonerate the practice of Christmas from scriptural condemnation. The day that the weak Jewish convert observed was a day formally warranted by scripture with designated disciplines. It was observed outside the church without involving the strong. The weak brother could be expected in time to mature in conscience and no longer feel obligated to observe it. In contrast, the “day” the Christmas celebrant celebrates is a pagan originated festival of unknown duration having no basis in scripture nor God-ordained disciplines. It is celebrated in the church and considered immutable. Thus we see that there is no relationship between the two “holy” days. Another verse often used by the proponent of Christmas is Colossians 2:16, “Let no man therefore judge you in meat, or in drink, or in respect of a holy day, or of the new moon, or of the sabbath days.” They interpret this to mean that they can eat and drink what they want and celebrate any day they wish. However the context shows that evil men were demanding that the Christians keep certain laws. Paul instructs them that they do not have to adhere to these commands and that they shouldn’t. His instruction is not that they can keep a certain day, but that they are not obligated to do so by those who would make them. Christmas is a deceitful Babylonian fable with assorted heathen traditions added through the centuries. You cannot mix it with Christianity and call it “worship in spirit and truth” any more than you can mix skunk manure with honey and call it a feast. Christmas is not part of the faith for which we are to contend. It is not that which the Lord Jesus Christ has commanded us to observe. It is not sound doctrine. Christians should abhor it for the demonically inspired Babylonian myth that it is. This examines whether we can use this passage to quiet our conscience in celebrating this holiday. Thank you, Mike! Mike, by mistake I reblogged this to my secondary blog and got rid of it when I noticed this, thinking I could reblog it to my primary blog. It wouldn’t let me. It did let me do a different kind of post that links to you (if you like). What a thorny issue that needs pure hands, a clean heart, and lots of self-examination.